On Friday, I introduce you to my novel, His Irish Eve. 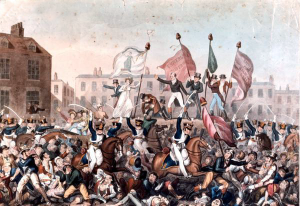 The events of that particular novel lead up to the hero and heroine being caught in the melee of the Peterloo Massacre. Adam Lawrence, Viscount Stafford, recognizes the need to leave the old ways of the aristocracy behind; however, his father, the Earl of Greenwall, is not so receptive to the changes sweeping across England after the Napoleonic Wars and on the edge of the Industrial Revolution. So, what exactly happened at St. Peter’s Field in Manchester? 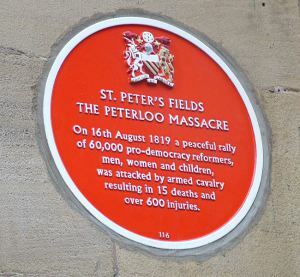 On August 16, 1819, the Peterloo Massacre occurred at St. Peter’s Field in Manchester. A crowd of 60,000-80,000 had gathered to protest the lack of parliamentary representation for the heavily populated industrialized areas. With the end of the Napoleonic Wars in 1815, the Corn Laws exacerbated the famine of the Year without Summer (1816) and the growing unemployment problems. By the beginning of 1819 the pressure generated by poor economic conditions, coupled with the lack of suffrage in northern England, had enhanced the appeal of political radicalism. In response, the Manchester Patriotic Union, a group agitating for parliamentary reform, organized a demonstration to be addressed by the well-known radical orator Henry Hunt. AOIFE KENNICE, the children’s cousin and caregiver, is a woman impervious to Stafford’s masculine charms, as one of England’s most infamous rakes. In truth, Aoife is not immune as she pretends, but she cannot imagine herself as the object of more than a flirtation on the part of the viscount. On balance, they are world’s apart: Aoife is daughter of a minor Irish baron and the opposite of her beautiful cousin Cathleen, who possessed all the skills to lure in a handsome viscount. To make matters worst, Aoife maintains the family’s a sheep farm to support Stafford’s family. A “lady,” Aoife is not. This entry was posted in British history, Great Britain, Living in the Regency, Regency era and tagged "His Irish Eve, Henry Hunt, Industrial Revolution, Manchester, Peterloo Massacre, radicalism. Bookmark the permalink. Wow I have never heard of this . How terrible, let us hope nothing like this ever happens again ! Unfortunately, there are always turbulent times. It is mind boggling that only 15 were killed. This type of horror still plays out across the world, even in our “enlightened” times. So depressing! Riots where the police and citizens confront each other is all too commonplace. Thanks for spotlighting a little known event. Glad you found the piece interesting. I think the most terrible thing was that this was a peaceful protest of unarmed men and women seeking liberty and freedom from poverty. The actions of the military were unconscionable. For me it was the loss of children in the melee. I include one such death in my story.